It’s been quiet around here lately. I’ve been wrapped up in a lot of projects and haven’t had any time to spend on the blog. And I’ve missed spending time here. I’ve also missed spending time browsing my favorite blogs, commenting and collecting new ideas. So, today I thought I’d just pop by to leave a sign of life and a quick update on what’s been going on. And a recipe of course. 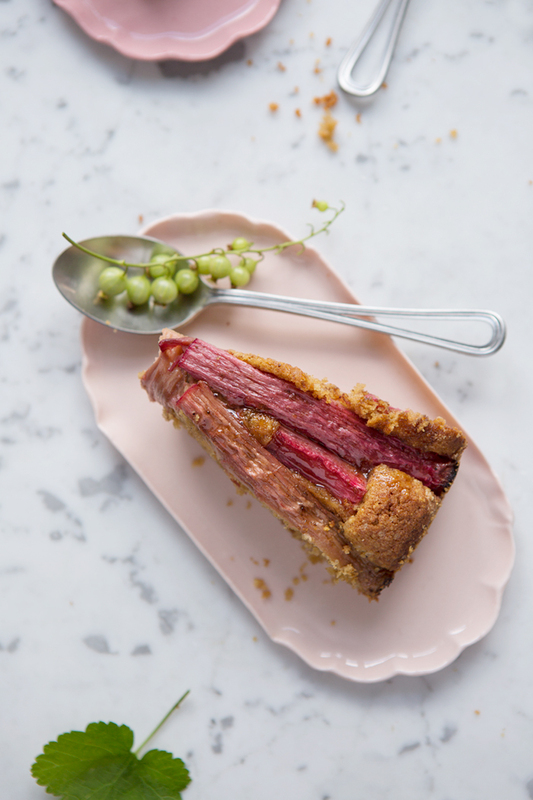 For the love of rhubarb. I’ve done a few photo shoots for both old and new clients. And there are so many more fun shoots to come this summer, among them I will be shooting a cook book with two awesome ladies in September. I’ve been planning for my workshop on Saturday and I’m really looking forward to this one. We’ve had some lovely lovely weather lately and spring almost turned into summer. Naturally we’ve spent as much time as possible outside and in the garden. 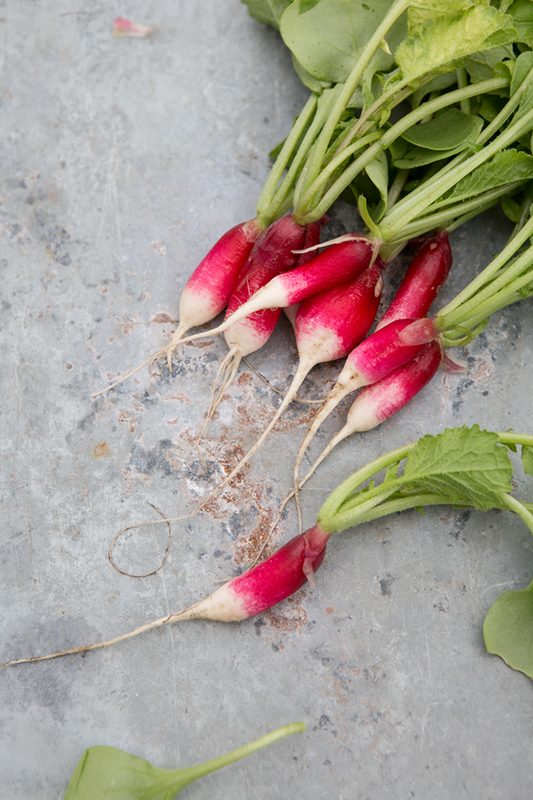 We’ve also harvested the first radishes and rhubarb which is pure joy every year! And now it’s time to make use of all that rhubarb while at its best. So let’s skip to the recipe immediately. This is one of my favorite cake recipes that I adapt from time to time to suit the fruit of the season. And this time I made it with rhubarb and vanilla because there’s no better flavor combo in the world if you ask me. And I sweetened it with coconut palm sugar, which makes it a somewhat healthier cake. Did you know that coconut sugar have the lowest glycemic index of all sugars and won’t make your blood sugar rush as with refined sugar. And I love rhubarb cakes that aren’t too sweet where you can actually taste the bite that rhubarb offers. I hope you’ll try it and that you like it as much as I do! Now I am curious to know – what have you been up to lately? 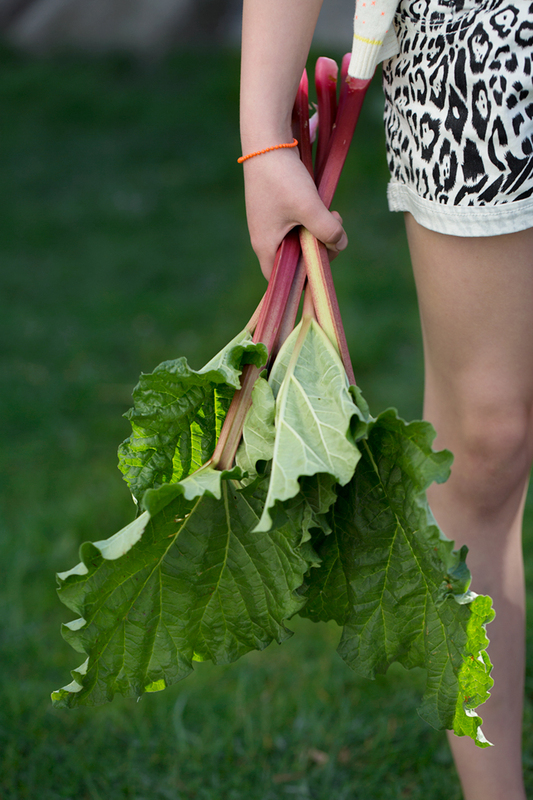 1) Wash the rhubarb stalks and cut them to desired length. You may want to cut each stalk two or three times lengthwise if they’re very rough. 2) Melt the butter in a frying pan on medium heat, add the sugar and vanilla and stir until the sugar starts to melt. Add the rhubarb and let it cook for about a minute or two, until just wilted. Set aside while preparing the cake. 1) Preheat the oven to 350° F (175° C). Line the bottom of a round cake tin (approx. 23-25 cm/9-10 inches) with parchment paper and butter the paper and the tin lightly. Sprinkle with almond flour if you like. 2) In a small bowl mix all flours, baking powder and salt with a fork and set aside. 3) Using an electric hand mixer or a table-top mixer whisk the butter, coconut sugar and vanilla bean together until it turns light brown and fluffy. Add the eggs a little at a time to the butter and sugar, whisking continuously. 4) When all the egg has been incorporated, fold in the flour mix using a rubber spatula. Scrape the mixture into the baking tray and spread it out gently. 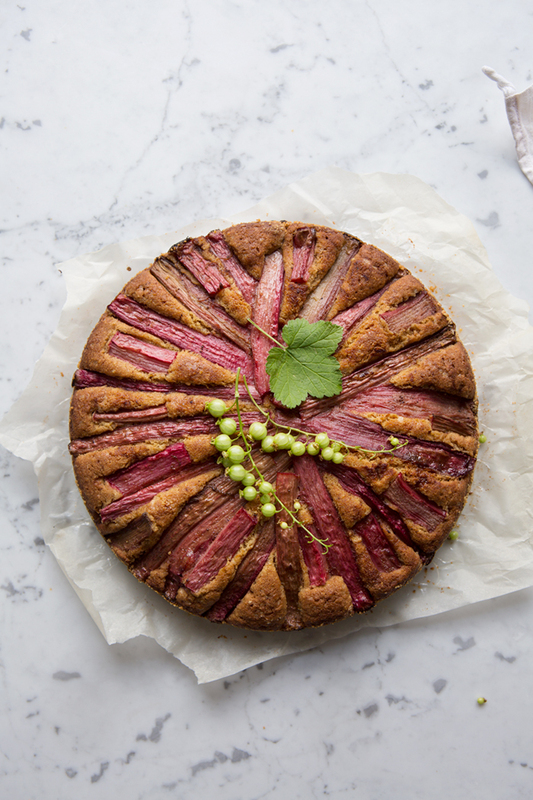 5) Divide the rhubarb on top of the cake and bake on the mid shelf for 40-45 minutes until a skewer inserted in the middle comes out clean. Let cool a bit before lifting the cake out of the tin. Then cool completely on a wire rack. So many beautiful photos! I love rhubarb season. I made a similar cake with almond meal a few weeks ago and it was delicious! Oh my… this is just so beautiful! What a treat to come across. Happy to make the connection. Oh, so beautiful photos! We too have been harvesting rhubarb and radishes, eating the radishes like candy and making cakes and compote out of the rhubarb. I love all these pictures, Sonja! So summery. 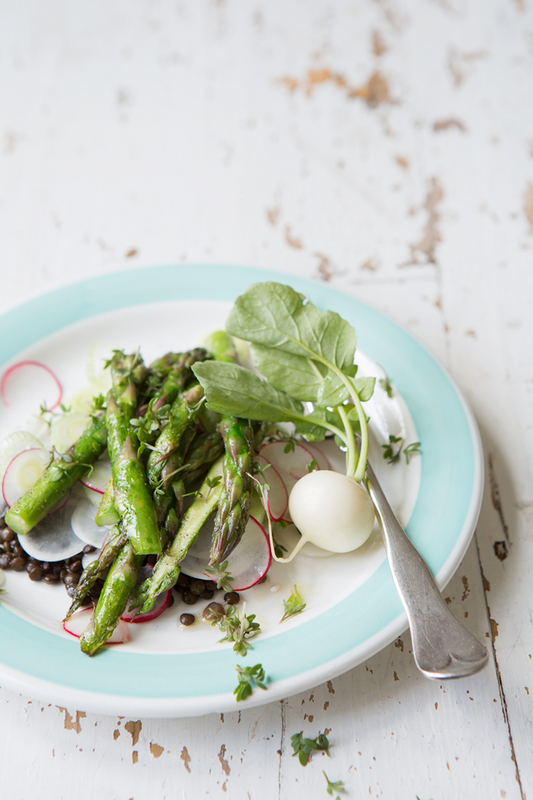 Those small radishes are gorgeous! Are they from your garden? Oh how I wished I had one myself! 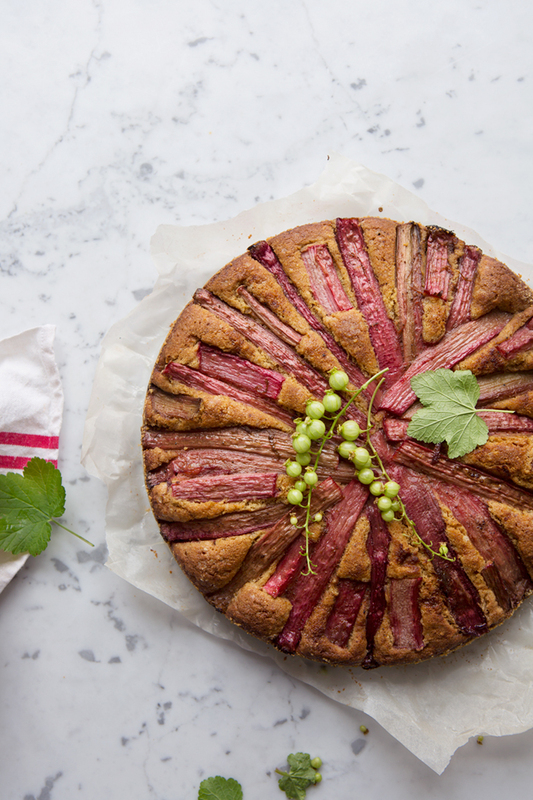 Rhubarb is one of my favorite summer fruit (although, it’s actually a vegetable but lets not talk about that) and I’m eager to try this gluten-free cake. It’s been crazy warm here in Finland this week with temperatures rising way above 25°C. Actually, I’m going to hit the beach after writing this comment. Have to soak up the sun, right? Juliana – thank you! This time of the year is wonderful – everything is so crisp and new! Sini – thank you so much! Yes, the radishes are from my garden. And sadly the slugs seem to like them just as much as we do… So I’ll better hurry up and harvest all of them ;-). Sounds wonderful to hit the beach – weather is the same here at the moment. One really should spend more time soaking up the sun! Are you drown the slugs? At my grandparent’s place in southern Germany they always cut them in halve with scissors… It’s quite gross to say the least. Oh I can’t believe I’m talking about killing slugs over here. Sorry. goodness, i cannot get over how beautiful these springy images are! and your cake sounds lovely, all the flavors sound so wonderful together. cheers, sonja! 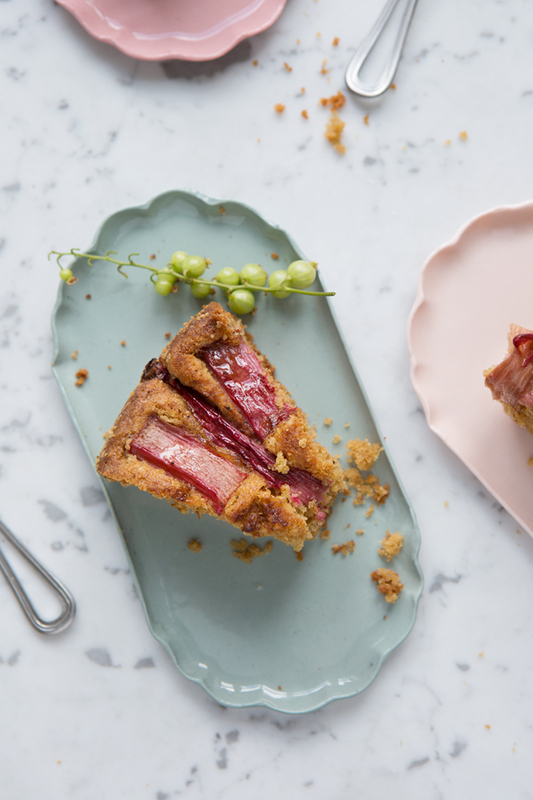 For the love of rhubarb – yum! I was so excited about this recipe. I whipped it up while thinking 2 tbs of baking powder seemed excessive but did it anyway. All. Over. The. Oven. I think you meant teaspoons? Shannon – So so sorry about that. Of course – it was meant to be tsp as in teaspoons. Thanks for letting me know! We still ate the ”flop”….I had just tossed a cookie sheet under the pan to catch the overflow. It was way yummy! looking forward to the 2 tsp beautiful version soon! First time on your blog! Mesmerizing!! what an amazing looking cake!!! sooo wish i lived closer so i could attend one of your workshops.